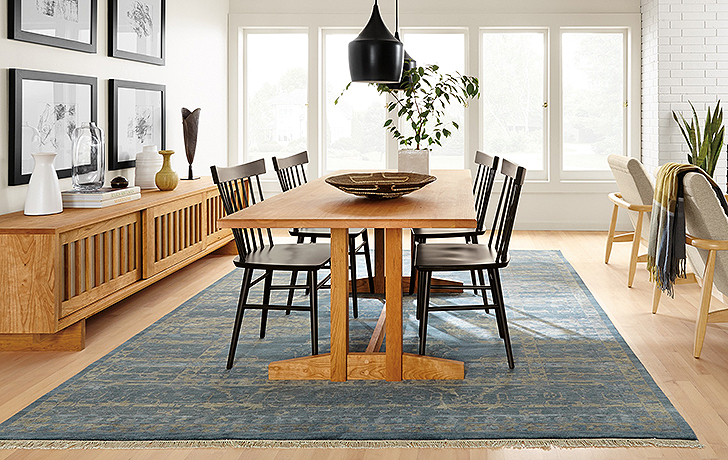 With so many different woods in our collection, we are often asked about the best way to mix woods in a room. The good news: there’s no wrong answer, because there are lots of great ways to mix and match woods to achieve a modern, intentional look. 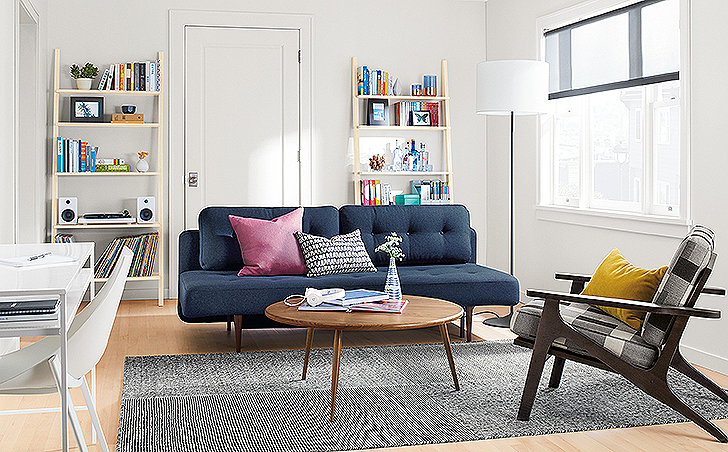 Here are four design ideas to show you how to combine wood colors in your own home. 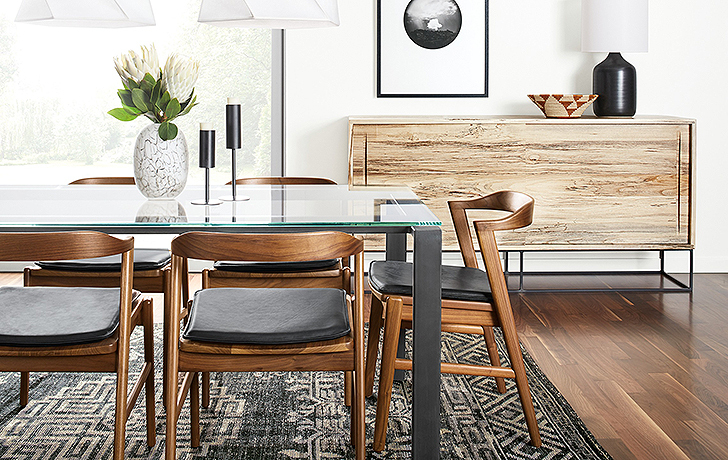 If you like an eclectic look, but still want everything to feel cohesive, the trick is to use each wood twice. The result: an interesting, layered look that still feels pulled together. The mixed woods in this room work because every piece has a friend. The black Thatcher chairs and Profile picture frames match, and even the maple legs of the Callan chairs pick up the light colored floor. 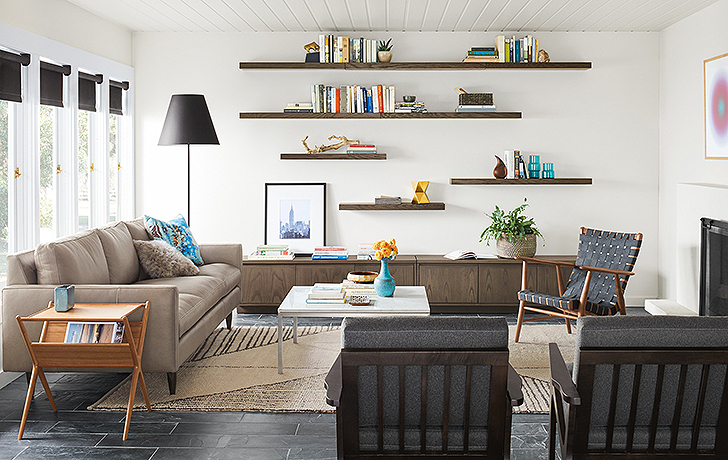 In this cozy living room, the wall of Float shelves shares the same finish as the Keaton cabinets beneath, the Ira wood chair coordinates with the Fitz end table and the black stain on the Sanna chairs ties in with the window shades, Soria lamp and Safi rug. This is an easy one. Matching all of the woods in your room creates a balanced feel and strong visual impact. Walnut is the star here. 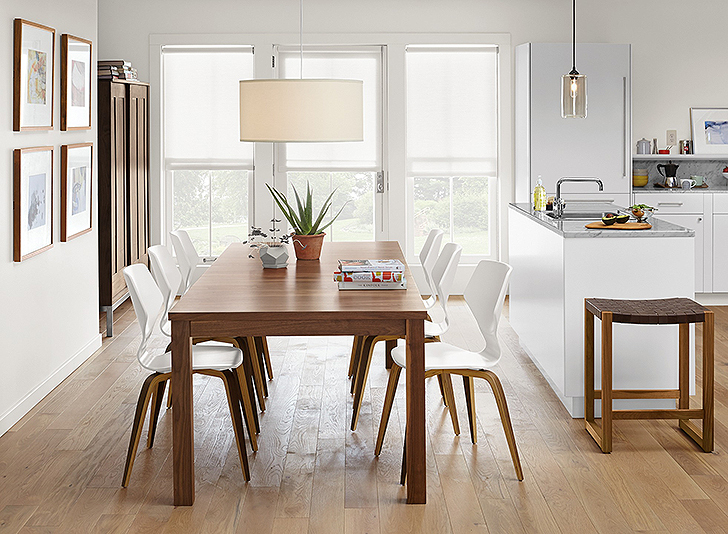 Against the light floor and white walls and cabinets, the walnut of the Andover table, Pike chairs and Linear cabinet makes this room feel grounded. 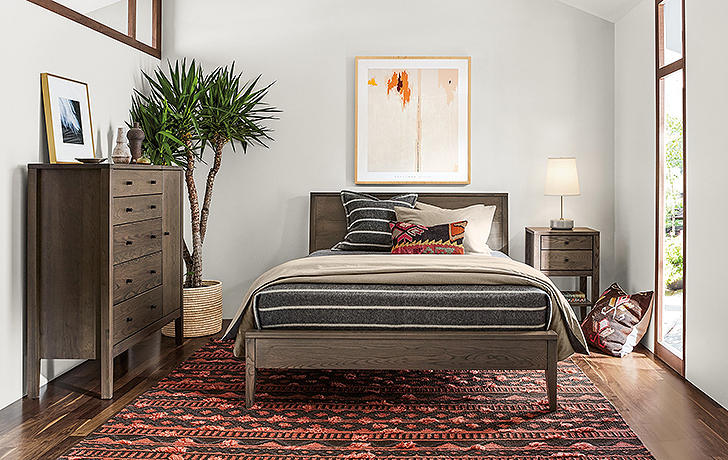 The simplified look of the matching Calvin dresser, bed and nightstand allows the colorful Ember rug, wall art and Kilim throw pillows (available in stores only) to stand out in this global-inspired bedroom. Unique woods like reclaimed timber, spalted sugarberry or live edge slabs of cherry or walnut display a range of color, acting as a bridge between other light and dark woods in your room. With the mingle method, you can pull in different woods and stains that tie back to a “bridge” wood and everything will feel cohesive. Our Allard end tables, made from sugar maple trees that were tapped for syrup, have a beautiful range of color. 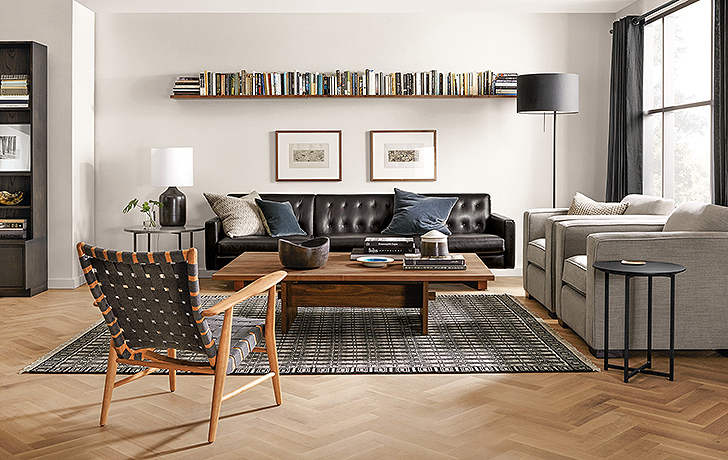 In this space, they tie together the Parsons coffee table‘s walnut top and the light maple frame of the Callan chair. Even though the Steen cabinet doesn’t “match” anything in this dining room, the light-to-dark grain pattern of the spalted sugarberry wood picks up on the walnut Jansen chairs and the black accents around the space. Trees live happily together in the forest, and they can in your home too. It is absolutely okay to mix different woods and not worry if they match something else in the space. Because we use natural woods and stain colors found in nature, our wood furniture feels authentic and goes together without a lot of effort. In this apartment living room, we mixed a walnut Wilder coffee table and charcoal-stained Sanna chair for a fun, casual look. This living room mixes a cherry Ira chair, walnut Corbett coffee table and bark-stained Keaton shelves for a mix of woods without repetition. 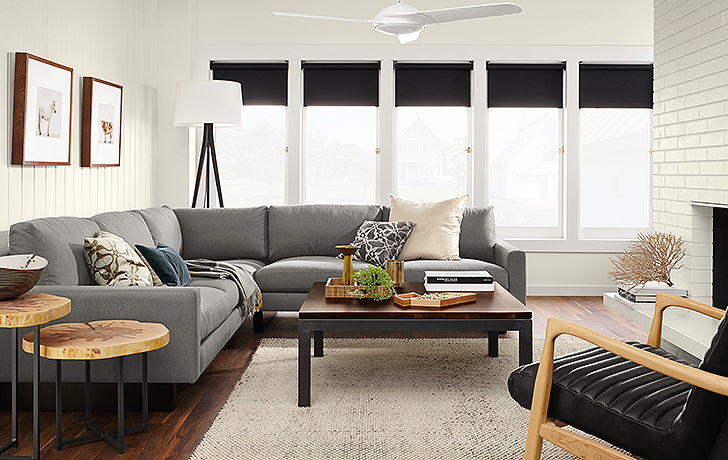 The space still looks intentional because we used black and grey to unify the other elements of the room.